Moroccan tiles, or Zellige in Arabic, is ornately intricate mosaic tilework made from individually chiseled geometric tiles. Zellige is used to adorn walls, ceilings, fountains, floors, pools, and tables, and range across a vast spectrum of color palettes. Originating with the Moorish people who immigrated to the Iberian Peninsula, Sicily, and Malta, Zellige has been a part of traditional Islamic art and architecture since the Middle Ages. Originally Berbers of North Africa and the Sahara, these people moved across continents over the centuries, melding and evolving their culture. This Moorish form of artistic craftsmanship flourished during the time of Hispano-Moresque, when Southern Spain and Portugal was the Al-Andalus, directly connected to the Maghreb, or Berber Northern Africa. Today, Fez and Meknes in Morocco are the primary sources of Zellige production. The clay tiles are primarily made of Kaolinte, a mineral clay consisting mostly of silica and aluminum. Over the centuries, the technique of fabrication evolved and began incorporating more and more colors, moving past an earthy, neutral palette. Once more colors were incorporated, it became more possible to create ad-infinitum, a pattern that appears seemingly endless in all directions. In these patterns we see elaborately embellished stars, octagons, cabochons, and crosses, and there’s not a place in the world where you wont catch a glimpse of Zellige somewhere. 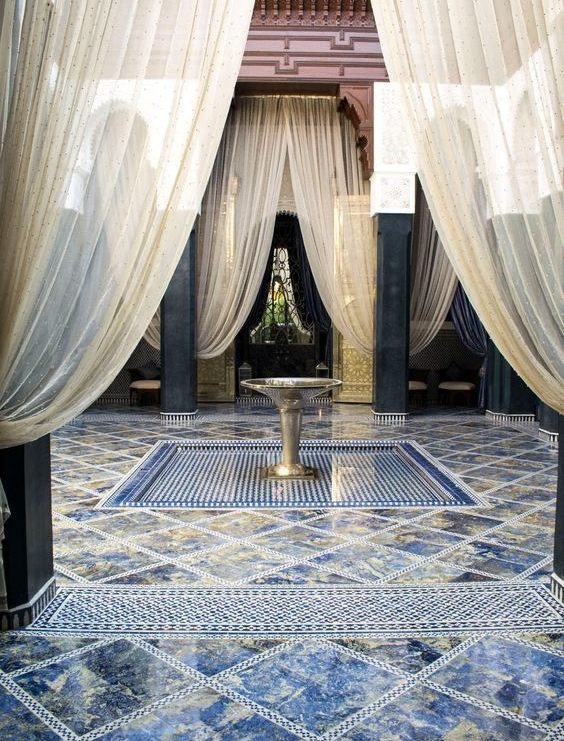 Take a peek at how Moroccan tiles are incorporated into the interior decor of these structures! We think the Marrakech, Morocco is one of the most romantic cities in the world, check out our article on the Seven Most Romantic Cities across the globe!